“Creditinfo Group” is well set on its track for growth and announces the acquisition of 33% of shares in the Kyrgyz Credit Information Bureau “Ishenim”. This strategic acquisition meets Creditinfo’s aim to contribute in growing economies and facilitating access to finance – a challenge that the company has been meeting for the past 20 years. “Kyrgyzstan is a market of great interest to us and we are very confident about this strategic investment. We have been successful in contributing to strengthening the financial sector of other countries in this part of the world, enabling better access to finance that tangibly contributed to economic growth of a country. We believe Kyrgyzstan will equally follow this success.” – said Samuel White, Executive Director of Creditinfo Decision Analytics. 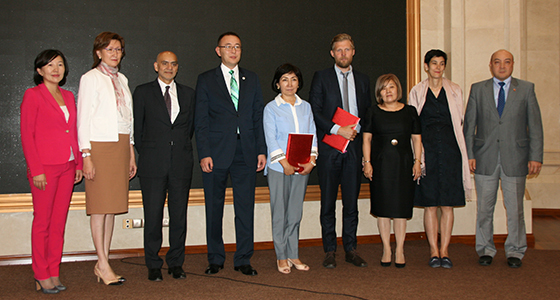 He added that the Kyrgyz financial institutions are now demanding more value added products, such as scoring, benchmarking, consultancy, automation and end-to-end solutions to improve the credit risk management. Additionally, he stated that in order for the non-financial sectors to grow faster, these institutions would need solutions and support in evaluating and monitoring the risk of customers too. Ultimately representing key opportunities and sizable potential for Ishenim. “Ishenim have established a strong Credit Bureau and we will strive to make it even stronger using the international experience and know-how that Creditinfo has gained over the last 2 decades.” – concluded Mr. White. A user-friendly platform to introduce new, innovative and contemporary credit risk management solutions for lenders and business. The overall benefits brought by a Credit Bureau are not just for larger firms, but also for individuals and SME’s, therefore it will be important to collect more information on those segments. This will, in turn, encourage financial institutions to provide better access to credit to individuals, as well as micro and small businesses, which is crucial to help maintain and build a healthy financial infrastructure. Ultimately, it will result in a lower percentage of non-performing loans and facilitate greater access to credit on better terms for those who deserve it based on objective criteria. To date, “Ishenim” has 35 full members, amongst which 22 commercial banks and 13 microfinance organizations. FCI Association “Credit Information Bureau Ishenim” was officially registered in the Ministry of Justice Kygyz Republic on March 17, 2003. The founders were: CC “Bank of Asia”, CC “Demir Kyrgyz International Bank”, and JSC “Energy Bank” (now JSC “Optima Bank”).